1984 to 1985 Medienausbildungszentrum Luzern: First concomitant basic course at the national journalism school. 1986/87 Radio Munot: Editor/presenter in the news and magazine parts of the local radio in Schaffhausen. 1988 WPIX Radio, New York: Practice period in the news edition and promotional department. Format: Adult Top 40. 1988 to 1994 Radio Z: Editor/presenter at the Zurich local private Radio Z. Domestic and foreign reports, news editing and presenting, own weekly magazine show "Et Cetera" covering actuality, presenter of the weekly partner choice broadcast.1993 partly program promotion for the 10th anniversary of the radio station. On-air-actions, binding of the audience through articles, competitions and outdoor actions. 1994 Ecole de la Langue Francaise: Language stay in Paris and Nice. 1994 to 1998 Tele Züri: Presenter/editor news broadcast Zürinews. Self-controlled text creation, shared responsibility for contents. Sporadic discussion leadership in the daily 30-minutes- talk show on politics, economy and society. Editorial responsibility of the weekly magazine "Lifestyle". First partly program as a presenter/editor at Radio 24, the biggest Swiss private radio. 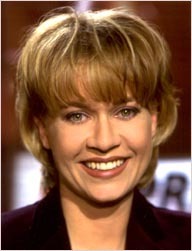 1998/99 Tele 24: Presenter/editor of the news broadcast Swissnews. First private TV channel in Switzerland with daily hourly news on a national scale. Self-controlled text creation and shared responsibility for contents. Reduced program as a presenter of Zürinews, the twin of Tele 24 on a local level. 1999/2000 RTL/ProSieben Schweiz: Presenter/Editor of the news broadcast Express. Self-controlled text creation and shared responsibility for contents. Moreover single 30-minutes talk shows on politics, economy and society. Express: High German, talk: Swiss dialect. 2000 bis 2003 SF DRS: Presenter/Editor News at noon. since May 2003 SF DRS: Presenter of the news broadcast "10 vor 10".